Create effortless curls at the push of a button with the CHI Air Spin N Curl, a revolutionary hair curler that automatically draws your hair into a rotating barrel to create glamorous, bouncy curls. 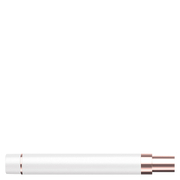 Helping you to create big curls or beachy waves, the innovative curling tool has a ceramic curl chamber that automatically draws in your hair; it softly heats before releasing freshly coiled locks. Utilising Ceramic Heat Technology, the tool produces far infrared heat and negative ions to condition for shinier, healthier-looking tresses. 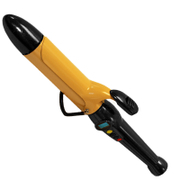 Suitable for all hair types, the curling iron offers an adjustable temperature up to 210°C, and is programmed with a selection of preset temperature settings depending on hair type; this provides customisable styling and helps prevent heat damage. 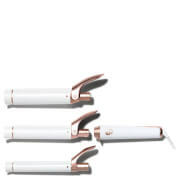 Includes CHI Air Ceramic Rotating Curler and Cleaning Tool.